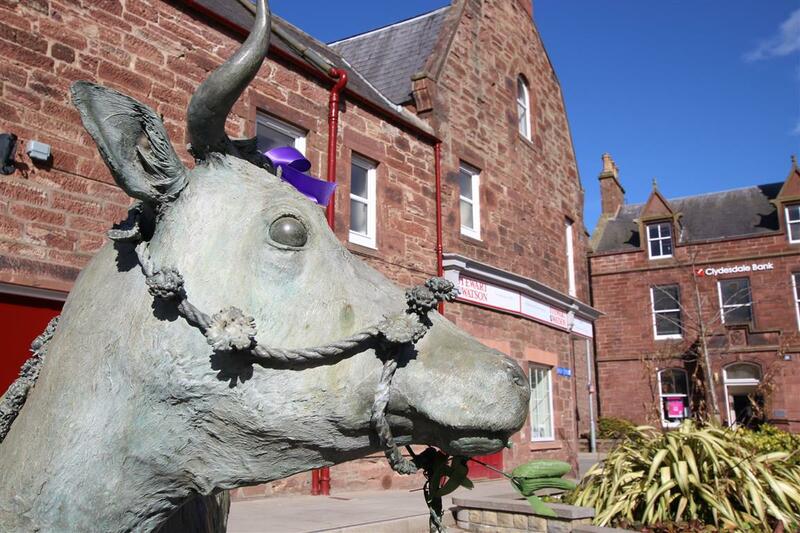 TURRIFF is a thriving community built of red sandstone and the main shopping centre for the surrounding farmlands. Over time Turriff has grown in size and developed as an important market and service centre for the farming hinterland. Great “Feeing Markets” were held in town in the 19th century where farm workers sought work from local estate owners. Produce was sent all over the UK when the railway arrived in 1857. Turriff gained national fame when one Robert Paterson refused to join Lloyd George’s new National Insurance scheme. A cow was impounded but when the Sheriff Officers tried to auction it a riot ensued and they were chased out of town. Other sale attempts failed and the cow was eventually bought by neighbours and presented back to Paterson after a procession through the streets. The famous story of the Turra Coo is well recorded in the town. The Mercat Cross, in Castle Street, Turriff was originally erected in 1512, and signified the right to have a market in the town. The cross was replaced by the current 20ft. high red sandstone structure in 1865. The Haughs is a large recreational park area, which boasts a children’s play area, seasonal boating pond and crazy golf course. The Auld Kirk is associated with St. Congan and King Malcolm Canmore. Originally 120ft. long and 18ft. wide it is now mostly a ruin having a gable remaining which houses an elaborate double belfry. Other places of interest include The Old Post Office Museum, which has regular exhibitions of local history, and the Session Cottage Museum which is a mid 17th century cottage furnished with 19th century artefacts and set in a courtyard location. The library, situated on the Square has a range of computers for Internet access.